Vancouver’s Winter Olympic Games were a success on a number of levels — athletically, culturally — and environmentally too. While I’ll admit to a bit of bias (Vancouver is my hometown and the men’s hockey game kept me on the edge of my seat until Canada took the gold from a gracious and talented U.S. team), I do think these Games were a model for how future international events can deliver on sustainability commitments. The Vancouver Organizing Committee for the Olympic Games (Vanoc) grounded its environmental commitments in real science and, as a result, these commitments had real meaning. This contrasts sharply with the approach Toronto took when it bid unsuccessfully for the 2008 Summer Olympic Games. In Toronto’s case, Greenpeace proposed a ban on a multitude of materials including Canadian lumber, tin, vinyl, and chlorine without any evidence these materials harmed human health or the environment. Instead of doing its own investigative work, the Toronto organizing committee took this ludicrous and scientifically baseless proposal seriously. The committee banned tin, which is a component in the production of bronze, and so, had Toronto won its bid, there would have been no bronze medals at the 2008 Games. Disaster was averted when Beijing was awarded the Games. By comparison, Vancouver’s approach from the outset was not to ban specific materials, as Greenpeace and other environmental activists continue to advocate, but rather to ensure materials were used appropriately, efficiently, and in the most environmentally effective manner. For example, instead of banning lumber not certified by the Greenpeace-endorsed certifier, the Forest Stewardship Council, Vanoc encouraged the use of wood in all its facilities — period. This resulted in wood being used prominently in Olympic venues. The use of wood was an environmentally sound decision because wood is the most abundant renewable building material on Earth. The more wood we use, the more trees are planted to provide it, thus keeping land forested that might otherwise be permanently cleared. Trees soak up carbon dioxide from the atmosphere, reducing greenhouse gases associated with climate change. Wood also scores very well across its entire life cycle, requiring far less energy to manufacture than either steel or concrete. It can be used for a wide variety of applications including framing, cabinetry, flooring, sheathing and cellulose insulation. 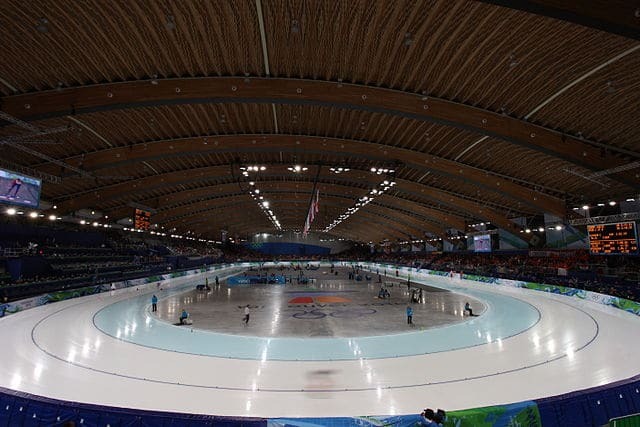 The beautiful ceiling of Vancouver’s speed-skating Olympic Oval was made of salvaged wood that was damaged when pine-beetles infested our forests. According to Vanoc, the roof is the largest surface ever covered in this salvaged beetle wood, which would otherwise have been discarded. Rather than discriminate against the use of vinyl, as environmental activists urged Toronto to do, Vancouver welcomed it. Few who were at the Games or watched them on TV could have missed seeing the large-format vinyl banners manufactured by 3M Co. that covered the Olympic venues, surrounding buildings throughout Vancouver, as well as attached to a fleet of 4,600 vehicles, 500 buses and eight ice-resurfacing machines. These large-format graphic banners featured images of the Olympic athletes and the natural beauty of British Columbia. Here too, vinyl’s application was a sound environmental choice because detailed life-cycle tests — which examine a product from manufacturing to transportation and installation through to the product’s final disposal — show that vinyl scores very well on a range of sustainability factors, including energy usage. Importantly, 3M spent significant effort on identifying what to do with the vinyl banners after the Games concluded. The banners will be reclaimed and recycled by Mannington Mills Inc. as vinyl-based flooring products, diverting some 200,000 square feet of material from local landfills. On the energy side, Vanoc embraced the use of hydropower in a province blessed with a bounty of it. While international activists boast to have blocked more than 200 hydroelectric dams and are campaigning to tear down existing dams, Vancouver 2010 went in the opposite direction. Embracing hydro was an important decision because hydro is the largest source of renewable electricity. In using hydroelectricity for 90 percent of its energy requirements, Vanoc reduced the need for pollution-spewing diesel generators and drastically reduced its carbon emissions. The approach Vancouver 2010 took in encouraging the use of wood, vinyl and hydropower contributed substantially to the sustainability of this year’s Olympic Winter Games. Unlike past approaches, Vanoc did not take activist claims at face value, but instead ensured science was at the forefront of its decision-making. An adviser to government and industry, Patrick Moore is a co-founder and former leader of Greenpeace. He is chairman and chief scientist of Greenspirit Strategies Ltd. in Vancouver.